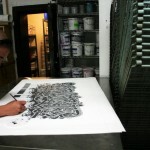 Production photos courtesy of DEFER and Luis & Tony at Modern Multiples. Containing 4 pages of interviews and samples of “DEFER”‘s work, The History of Los Angeles Graffiti Art Volume 1, 1983-1988, establishes “DEFER” as a pioneer in the Los Angeles street art scene. The History of Los Angeles Graffiti Art: Volume 1, 1983-1988 is the first book in a series of four books that covers the years 1983 to 2005. Volume 1 is based on the years 1983 to 1988 and is the starting point to the real story behind the movement that began in the early 1980s. 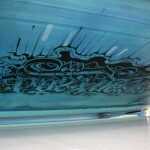 The book documents all aspects of Los Angeles Graffiti Art, while keeping it real and uncut. Some pictures may seem familiar, while others may not. This book will provide you with an unbiased look into this world through the eyes of the people that have lived it. 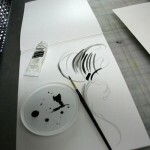 Within the book, you will discover the truth behind the photos and stories. 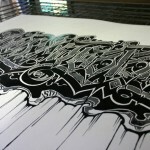 "LOS ANGELES" by DEFER 2011. 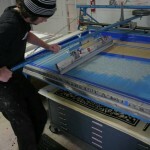 5-Color Screenprint. 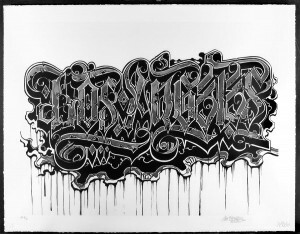 MORELWORKS Fine Art Publishing and Alex DEFER Kizu (K2S/STN) are proud to present: “LOS ANGELES”. 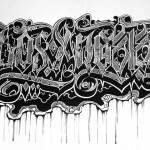 The pioneering L.A. writer has been interviewed for, and has had work featured in 3 books, and will be exhibiting work in the upcoming “Street Cred: Graffiti Art from Concrete to Canvas” show at the Pasadena Museum of California Art. 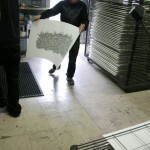 The 5-color serigraph is entitled “LOS ANGELES” and is based on of his gouache painting of the same name. 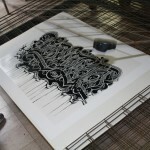 MORELWORKS and DEFER will co-publish this edition of 80, signed-and-numbered prints. 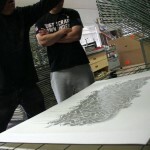 “LOS ANGELES” will be released to the general public on Sunday, April 17, 2011, in our shop. 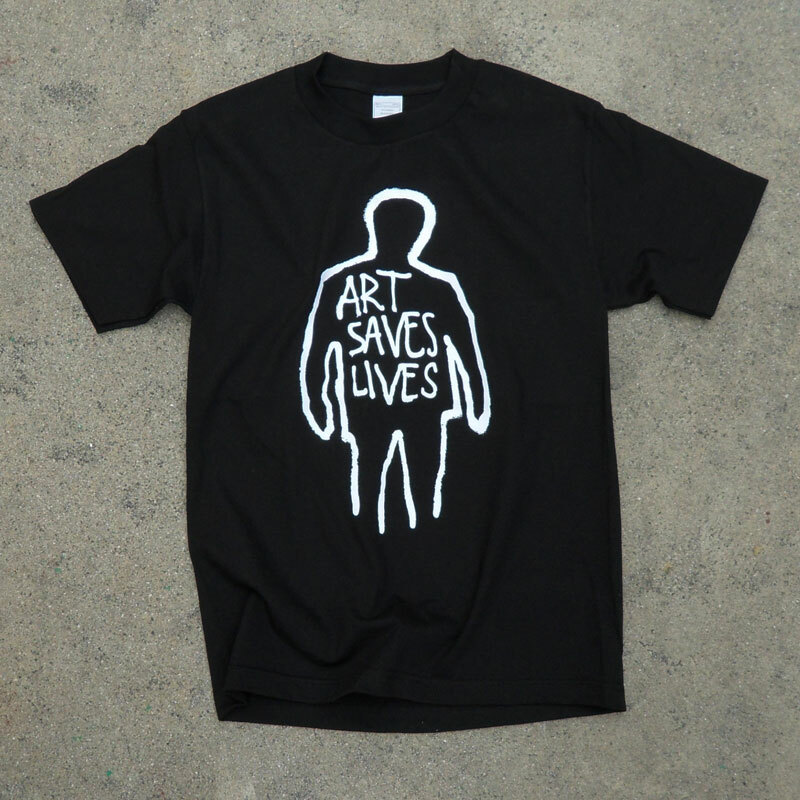 Limited-Edition “ART SAVES LIVES” T-Shirts On Sale! 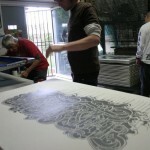 A while back we printed a few printed a few promotional tees celebrating the release of our ART SAVES LIVES serigraph, the first-ever fine art print from The Phantom Street Artist, designer of Rage Against The Machine’s album cover “The Battle Of Los Angeles” and featured artist in the TASCHEN book by the Wooster Collective, “Trespass: A History Of Uncommissioned Urban Art.” The response was so enthusiastic, we decided to make a few t-shirts available to the general public in a limited-edition run with just the art, no logos. 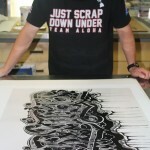 The limited-edition tees won’t be around forever. Get yours today before they’re gone! 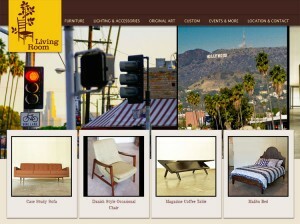 After showing at CREWEST for the month of February, our “ART SAVES LIVES” print has found a home at the Living Room, Steve Melendrez’s super-hip home furnishing shop. Located in the heart of Silver Lake, Living Room is a thoughtfully curated mix of retro, futuristic and rustic home furnishings, along with some killer art from heavyweights such as John Van Hamersveld, becca and our very-own Phantom Street Artist. 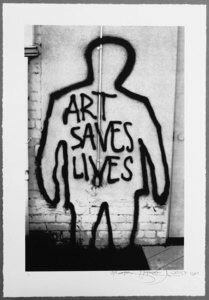 Stop by the shop, pick up one of the remaining “ART SAVES LIVES” prints and check out the street art that adorns the building and parking lot area. 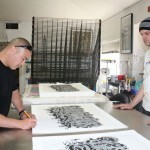 You’ll find an untouched 3-year-old BLEK LE RAT stencil piece and a Phil Lumbang painting, among other works! 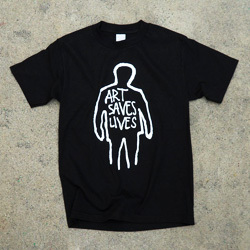 "ART SAVES LIVES" T-shirts IN STOCK! 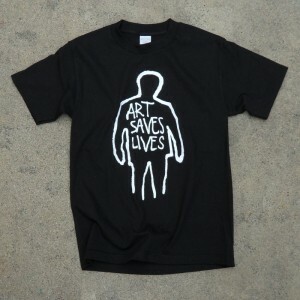 "ART SAVES LIVES" Serigraph In Stock!